Are You Looking to Improve Individual and Organizational Performance and Health? 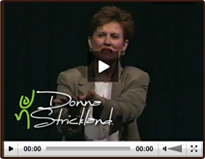 Thank you for your interest in Donna Strickland’s speaking and consulting services. We look forward to hearing from you and answering any questions you might have. Please contact us directly by phone, email or through our secure contact form below.